This piece uses the slide at the twelfth fret to play the main riff followed by a strum on the open strings for 3 beats. This covers 2 bars in all - this section then repeats to give the first four bars on a D chord. Note - if you are using the slide on a finger other than your pinky you may not be able to play this - in which case just strum the rhythm here. Repeat the first two bar riff for two bars on a D chord. The slide at the fifth fret giving a G chord for one bar. 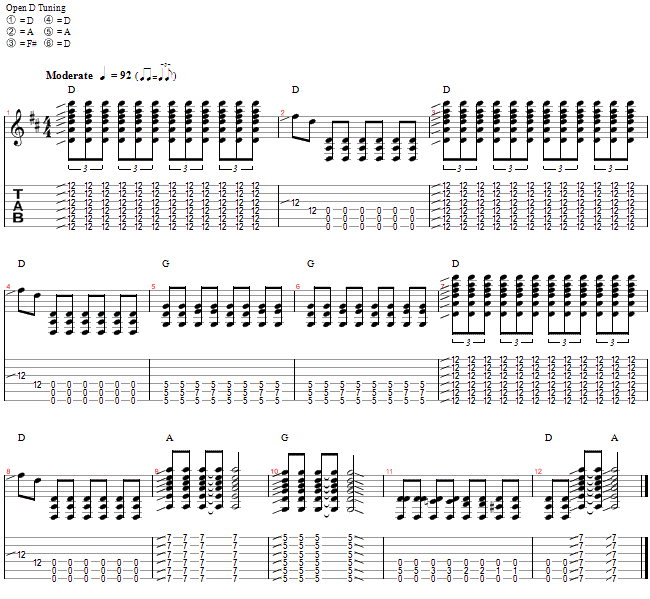 Finally a two bar rundown ( using L/H 1st finger ) followed by a seventh fret chord which leads back to the beginning. This is called the Turnaround.